We take its burning stare for granted. It has always been with us. Its presence provides a warm comfort. For over four billion years, our local star, the Sun, has been powering the Solar System. 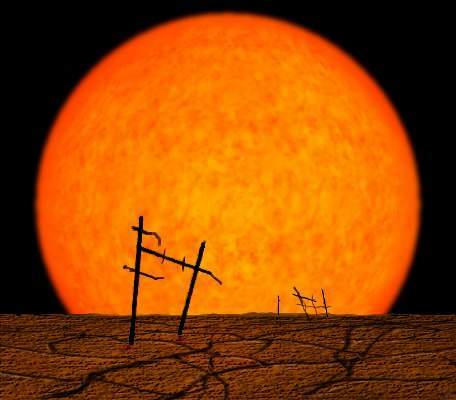 Our star, the Sun, is the single most important factor for sustaining life on Earth. Of all the equations that exist, this one is probably the simplest. No Sun equals no life on Earth. The Sun is huge in comparison to the Earth. At 1.4 million kilometres (865,000 miles), our nearest star is over one hundred times larger than our own planet. 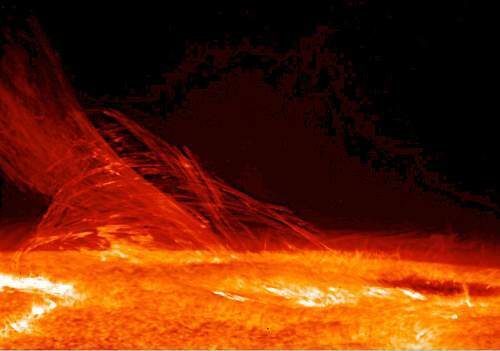 The surface temperature of the Sun is 5,500 degrees Celsius (9932 Fahrenheit). However, its core is a hard-to-fathom 15 million degrees Celsius (27 million degrees Fahrenheit). Although the Sun is little more than an average-sized star, its effects on the Solar System are enormous. Its gravitional field extends to one light-year curving the fabric of space-time as it does so. Like the planets, the Sun rotates. One rotation can take between 25 to 34 days. A mass of activity, the Sun is constantly in flux. Ever-changing, sun spots appear and disappear on its surface while huge bursts of materials are flung out weighing more than 100 billion tones as they hurl at millions of kilometres per hour reaching the far reaches of the outer Solar System. We sometimes see this radiation as the Northern Lights. 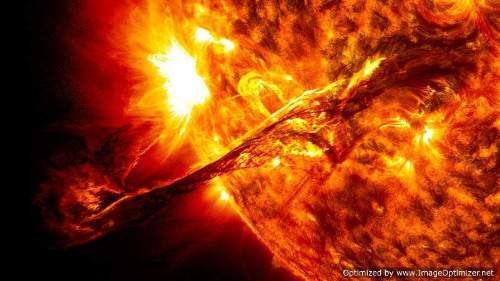 The nuclear-fusion powered core of the Sun is the massive engine for the star. 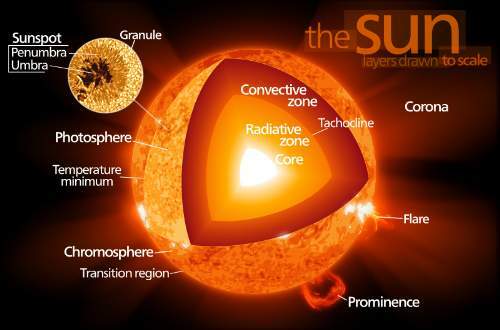 Heat from the core travels slowly to the outer surface, the convective zone, after about an estimated 100,000 years. The Sun is made up of layers. At the very heart is the core, it takes up a relatively small portion of the Sun’s volume. The next layer is called the radiative zone, which is transparent. This is followed by the convective zone which is opaque and finally the outermost layer called the photosphere. Our Sun, like other stars, goes through phases or Solar Cycles. These typically last 11 years or so during which time the Sun’s activity varies from periods of little or no activity to solar storms. One of the most noticeable aspects of the Sun’s solar cycle are sunspots. These seem to be dark spots that appear and disappear on the surface of the Sun. They only appear dark because they are cooler than the surrounding surface. In fact, they are very bright. In periods of low activity the spots will be quite sparse and are generally found 30 to 40 degrees north and south of the star’s equator. After about five years – the solar cycle reaches its peak and sun spots appear in greater numbers and more frequently. They also form much closer to the equator, roughly 15 degrees north and south. Following the end of the cycle the Sun switches its magnetic polarity and the cycle starts over. 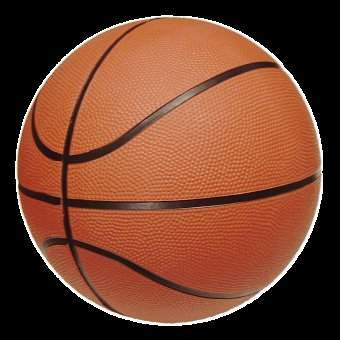 If the Earth was the size of a regulation size 7 basketball what distance would the Sun be from the Earth? To give you some inclination about the distance. If the Earth was the size of a basketball the Moon would be approximately seven metres (22 feet) away. If your answer is 2.8 km (1.7 miles) you are correct. The Sun, at 4.57 billion years of age, is nearly half way through what is called its main sequence age. After ten years or so the Sun will start to expand into a red giant and potentially swallow up the Earth and the inner planets. But it is unlikely that the Earth will be inhabited by life when this expansion occurs. As the Sun is gradually getting brighter due to slowly rising temperatures. It is believed that in one billion years, the temperature rise will be enough to ensure that there is no more liquid water on the surface of the Earth. Eventually the Sun will contract into a white dwarf and will gradually grow cold. Nonetheless, it is best not to worry about the fate of humanity as we will probably have found a new home, or several new homes, long before then. Check out Yellow Magpie’s The Solar Maximum: The Years The Earth Is Left Defenceless and our index page The Solar System And Beyond: A Guide To The Cosmos for a comprehensive look at the Solar System. Cosmos is a highly recommended book. It contains large, full-page pictures of the Sun and its critical role in life and insightful writing on the subject by the highly competent author, Giles Sparrow. 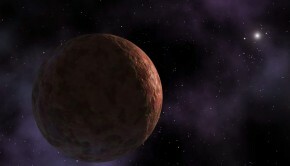 Pingback: The Dwarf Planet Ceres: A Watery Life-Filled World?